"STAR, The Unfolding Story, 2001-2011, A 9/11 Commemorative Edition," honors those who died and those who have died since 9/11 while documenting the impact the STAR program has had across the world. The tragedies of 9/11 sparked the development of a unique approach to trauma-healing at Eastern Mennonite University—an acclaimed series of trainings called Strategies for Trauma Awareness and Resilience (STAR), refined with the help of thousands of participants in the United States and internationally. 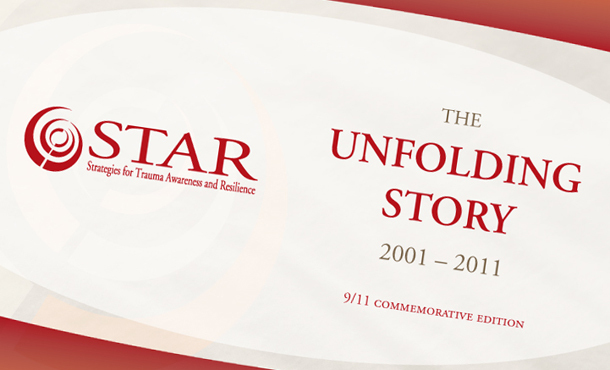 The inspiring story of how STAR emerged in late 2001 to support traumatized religious leaders and caregivers in New York City is contained in a just-issued e-book “STAR, The Unfolding Story, 2001-2011, A 9/11 Commemorative Edition.” It is available for downloading on EMU’s website, emu.edu. In addition, Barge believes the e-book can provide another informational tool for organizations and individuals who are interested in knowing more about STAR and how it facilitates trauma healing and training. Interest in the STAR program is as high as ever, according to Barge. The challenge for Barge and the STAR trainers is getting the program in the hands of non-government organizations (NGOs), specifically those struggling due to economic stress. The e-book seeks to change that. Over the next 10 years Barge believes STAR can continue growing through government and non-governmental organizations. “We anticipate the growth of STAR to continue through expansion of technical assistance, specialized training for veterans and youth, and offering STAR for credit at EMU,” said Yoder. To learn more about STAR, the commemorative e-book or training opportunities contact Jennifer Fawley at 540-432-4651 or jennifer.fawley@emu.edu.